Another day at PETCO, another precious hour of life wasted in the giant sandbox. There wasn’t a single ball hit there during batting practice, and if it weren’t for Ben Johnson, I would’ve been freaking out when the rest of the stadium opened at 5:30pm. 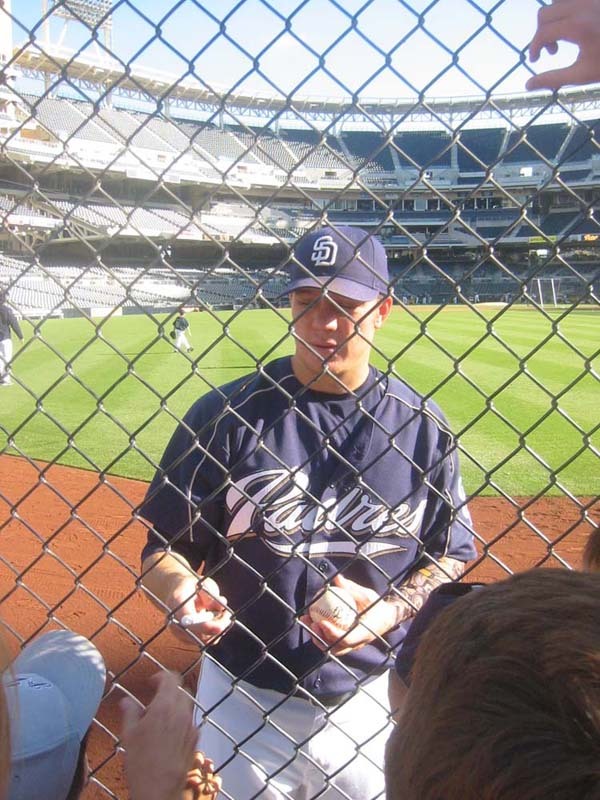 In addition to the ball, I got Jake Peavy to sign a Mets-Padres ticket stub from one week earlier, but still, I couldn’t wait for the rest of the ballpark to open, and in a way, I couldn’t wait to get out of San Diego and just go home. There was no chance I was going to reach 2,900 balls on this trip. PETCO wasn’t just challenging; it was flat-out kicking my ***. That said, I wasn’t about to hide in a bathroom stall, so at 5:30, I went to left field and managed to get a ball with my glove trick. It wasn’t easy. 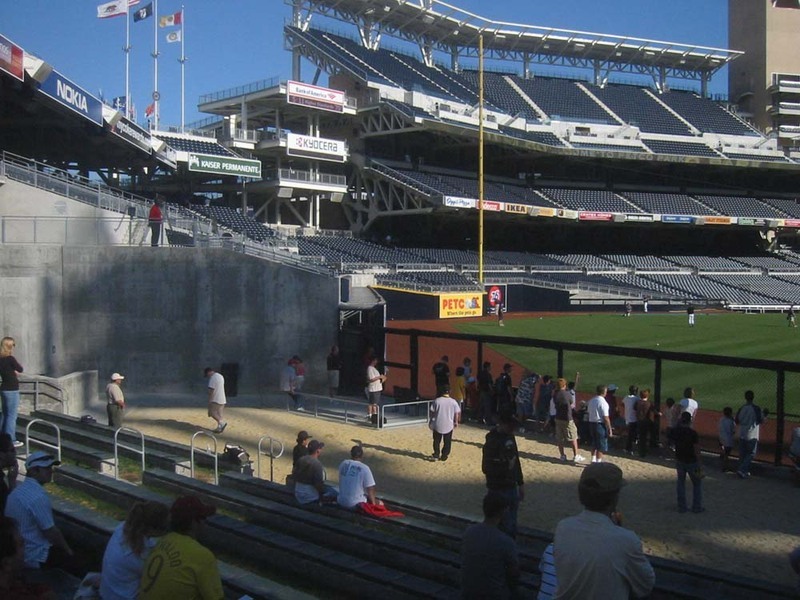 There’s a double wall in front of the seats with a fence-covered gap in the middle. I had to lie across it and stretch way out just to see the ball down below. 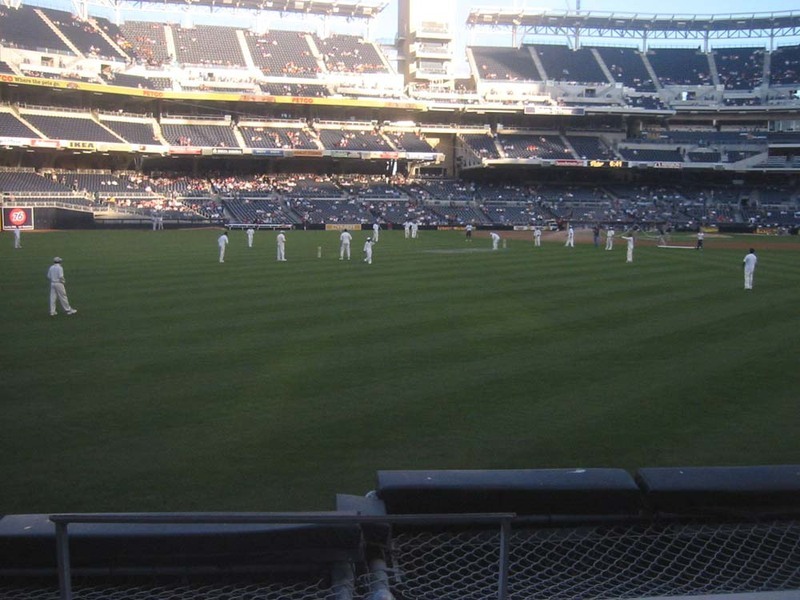 Batting practice was almost over–yeah, THAT fast–and the seats were packed. I hadn’t yet tried my luck in the corner spot down the third base line, so I ran over there and snagged my third ball of the day. Ray Durham sliced it into the seats, sparking a mad scramble. Luckily, the ball trickled into my row, and I grabbed it off the concrete steps. It was 6:15pm before I knew it. 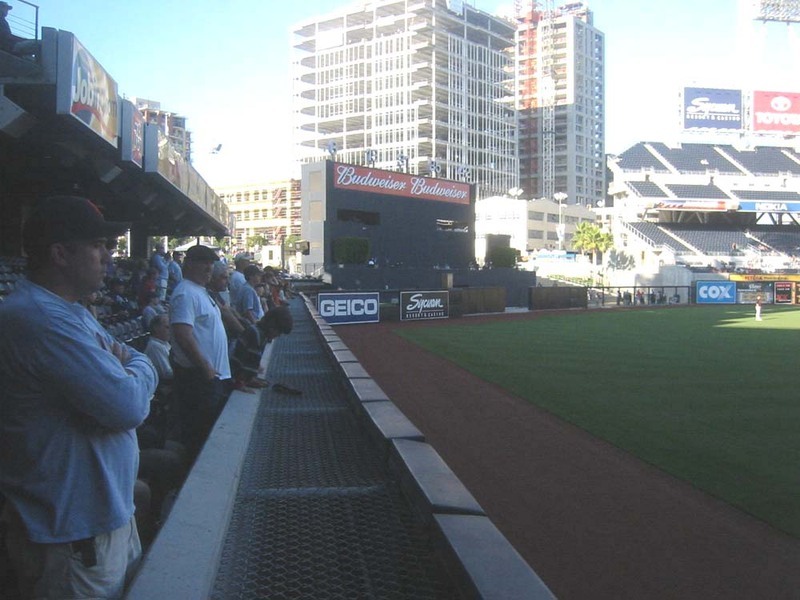 Batting practice was done, and the stingy Giants failed to give me a ball at their dugout. Five minutes later, a whole bunch of guys, all dressed in white, started playing an exhibition cricket match in shallow center field. (I’m sure the grounds crew loved that.) I’d done all my wandering and photo-taking the day before, so I had nothing better to do than head to the left field seats for a closer look. One of the players actually hit the ball into the seats. I totally wasn’t expecting it. 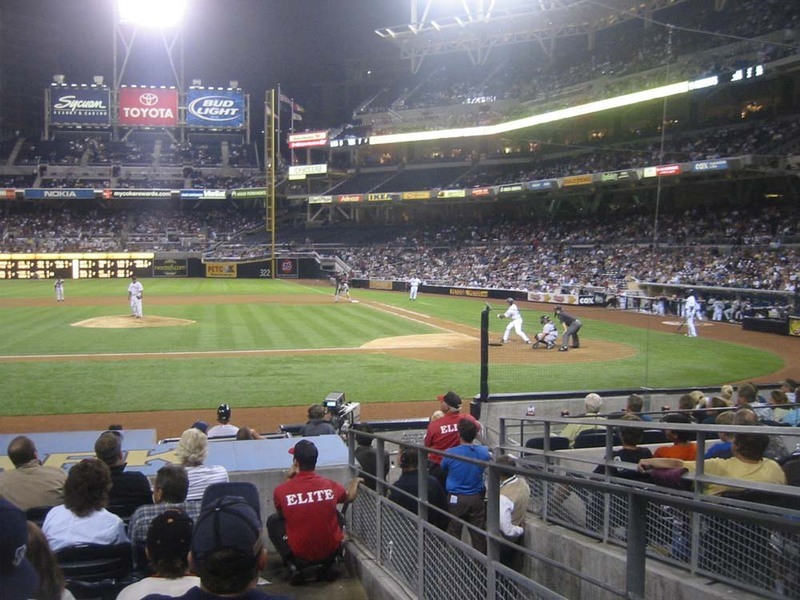 At that point–the lull between BP and the game–my glove was tucked away in my backpack, but that didn’t stop me from jumping up and bolting after it. I almost got it, but the damn thing took an unlucky bounce to some other unsuspecting fan. The match stopped. Everyone in the stadium was staring at our section. Turns out it was the ONLY cricket ball these guys had, so one of the players had to run over and ask the fan to return it. The club made one more play, and ball was hit to the left field wall. The fielder who ran after it didn’t bother firing it back in. Instead, he scooped it up and underhanded it to some fans in the first row, but it fell short and hit the top of the wall. Ha! I knew the guy was going to run over and give it another toss, so I climbed over a few rows of seats and squeezed in amongst the crowd. Sure enough, he jogged over and grabbed the ball and flung it right to me. And just like that, my newest collection was underway. The ball was HARD. Baseballs have a bit of give–you can dig your fingernail into the surface and make ridges–but this thing didn’t. It felt like polished wood. Weird weird weird. And cool. Randy Winn dissed me once again. Does anyone know this guy? What’s his problem? Is he trying to get jinxed? Just before the game started, Brian Giles tossed his warmup ball into the right field seats. (I was already out there for Barry Bonds purposes.) Everyone reached for it. No one caught it. The ball bounced back over the wall and landed on a small fenced platform just out of reach. I was about to set up my glove trick when an usher scurried down the steps with a special device used for retrieving such balls. “Is there any chance I could have it?” I asked politely. He disappeared with the ball. Barry was worthless. He grounded into the shift in top of the second, drew an intentional walk in the third, struck out in the fifth, and flied out to center in the eighth. 0-for-everything. Thanks. I appreciate it. I’d already worked my way down behind the dugout by the time Armando Benitez fanned Dave Roberts to end the game. (Final score: Giants 3, Padres 2.) Felipe Alou ignored my request for the lineup cards, but Benitez tossed me the ball on his way in. He had briefly scanned the seats for a younger/cuter recipient, but when I repeated my request in Spanish, his eyes returned to me. I wasted no time in writing “2892” on the ball so I’d always remember that it was the one he used to earn his 15th save of the season and 278th of his career. Nifty. He’d read my book. That’s how he recognized me. He was with his father and brother. 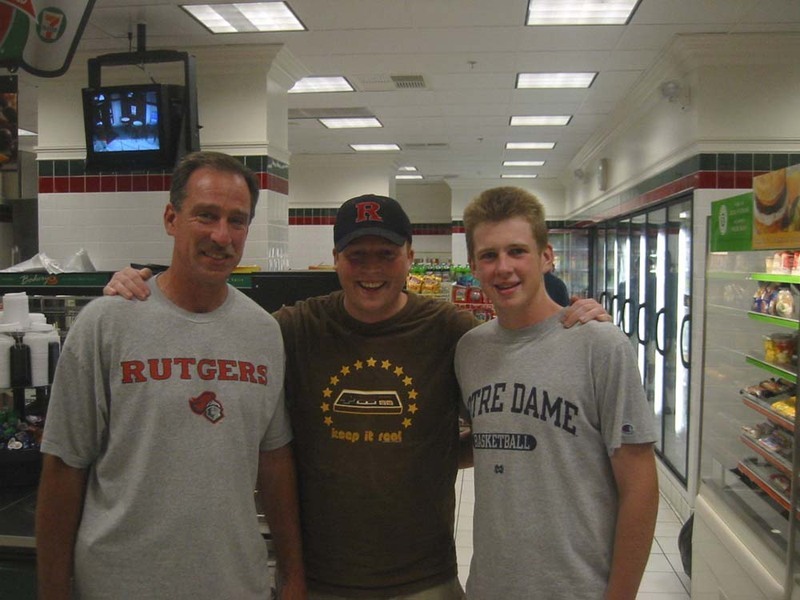 They’re from New Jersey, and they were on a ballpark tour–and for a moment, we all shared that special baseball bond, knowing that we were on the best kind of vacation in the world. • Competition Factor = 126,404. • 140 balls this season in 19 games = 7.37 balls per game. 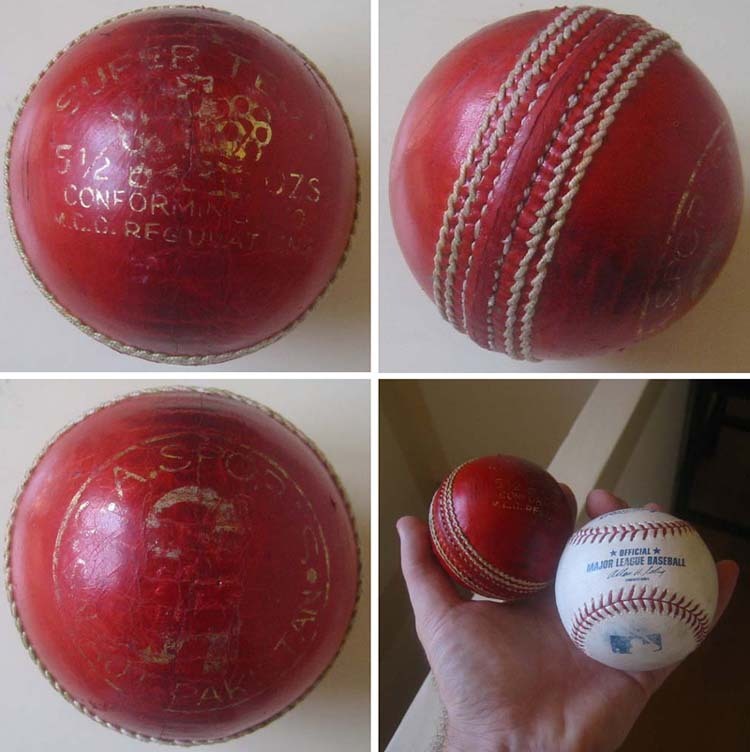 You’re only 2,891 cricket balls behind your b-ball swag. What now – off to the U.K.? Zack Did you catch that homerunball from Barry in Game 3?? Snagging a cricket ball in San Diego? I’m seriously impressed! Long time no speak … sorry about that. I see you’ve been collecting all SORTS of stuff. What next? On-deck circles? i really think randy winn wants to get cursed. maybe he justs wants to try his luck on a new team? who knows? you did you catch the home run ball? Anticipating your Game 3 blog!! And seriously, is Randy Winn wanting to end up on your list? Anyway, good to see you being recognized! Zacky, your famousness is starting to get in the way of your ball-collecting. It’s not just Pedro who recognizes you anymore! Just wait until next year when you’re even more famous…you’ll have to start wearing a fake beard to the ballpark or something. Nah, the food would get to me. I forget. I mean…I’m about to start writing about that game, so check back tonight and you’ll find out what really happened out there in right field. Thanks! I realize it’s completely wacky how it all played out. Hey. I was thinking of you out there in Phoenix and wondering how the USSO was going and if you were gonna make it to the ballpark formerly known as Bob. Too bad about the Bonds ball. Were you there with a whole bunch of people I’d know? I haven’t seen results for the USSO. Do I want to ask how you did? I’ve never jinxed a player for anything related to autographs. Only balls. It might be time to start a new category. Which home run ball are you talking about? Mark Bellhorn’s in the 4th inning? It’s nice to know that you (and other folks) are looking forward to my next entry. That makes it so much more fun to write. Like I said, I’m about to get started on it. It’s going to take *all* day to write about it, and when you see the entry, you’ll understand why. I thought I saw you catch that Bonds homerun. Hurry up and get that entry written. I’m going as fast as I can, which isn’t fast at all. I saw you catch the bonds ball i was at the game. I stole your 2,900th ball but you got another one from that one guy. 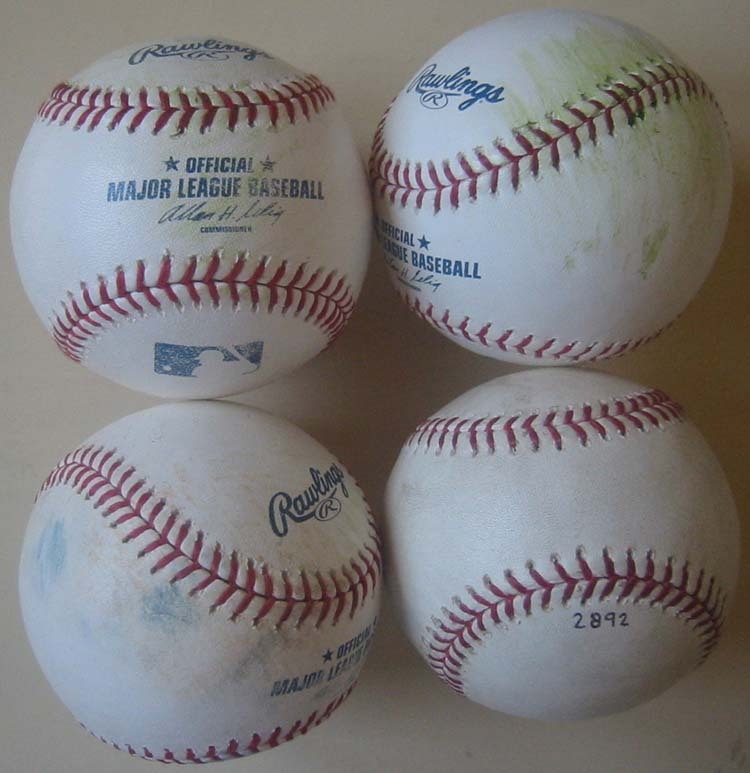 I have a collection of 8 mlb balls now. Im catching up to you. :O is gold fish telling the truth? yeah im telling the truth. he asked a guy for a ball and i jumped in front when he tossed it to him. Zack are you gonna post tdy or 2morrow? Ya, Zack, today or tomorrow? We are all desperately waiting!!!! Any estimate of when yur blog is gonna be set up. Like around what time so I can be the 1st to read. kaylee this is the boston payback we have been waiting for to give back to New York! Check out my huge feature story on my blog! It’s called “Birds on a Bat: What It’s Like to be a Cardinals fan”. It’s long, but I want to share my story with everyone. I’ve written over 2,000 words. Probably just a few hours to go. I’ll get to everyone’s comments eventually. Baseball aside, this is still a VERY busy weekend for me. 1. Im sitting in right field home run seats. what time does the stadium open? 2. who is most generous? 3. should i bother with the autos? 4. where should i stand for BP? 5. when should i leave BP to get autos? 6. how do i get the lineup cards? 7. aproximately how much time does each team use for bp? 8. Should i mention to David Ortiz that we share the same birthday? 9. Should i saw happy birthday to tim salmon, and is there a chance he would throw me a ball? 10. Which gate opens first, and at what time? 11. When the stadium first opens where should i go? 12. Do you think you could estimate how much time you think would be good to spend in what area starting from when the stadium first opens? I already printed out the coaches, but am waiting until the day of the game to print out rosters. i do not have a glove trick, and no angels hat either, so when angels take the field i will have to not wear my red sox hat. oh and another question who besides david ortiz, and manny ramirez should i ask for a ball in spanish? Just finished writing it. I have EIGHTEEN photos to upload, some of which are collages, each with four images. That’ll take 20 minutes. Then I gotta give the whole thing (over 3,000 words, I think) a quick read, do a spell-check, and then post. So let’s say…by 3am? Just a guess. Do what you gotta do. This better be worth it I have to get up at 8 AM and I’m staying up for this update. oh zack and another question is, when the players are at BP, do they wear their jerseys, or a shirt with no number over it? if so, should i print out a picture with everyones face on it? I knew which ball you were talking about. I was just messin’ with ya. I answered all your questions on my “8/16/06” entry. That was YOU?! Oh man. If Lefebvre hadn’t given me another shot, Bonds’ homer would’ve been my 2,900th ball. I’ll check it out if/when I can. I’m still incredibly busy and trying to catch up on a week’s worth of personal stuff that I had to put on hold when I headed to the west coast. Hi – I’m trying to find out how much I could get for a Yankees baseball: 1973 signed by the whole team. Anyone know? The WHOLE team? Wow. I’d guess that it’s in the $500 to $1,000 range. Maybe even $2,000.